Easily taken for granted in North America when the countryside is awash with its yellow flowers in fall, goldenrod is better appreciated in Europe as a medicinal plant. The European species is officially recognized in the German Pharmacopoeia for the treatment of kidney and bladder disorders and for its excellent diuretic and antiphlogistic activities. It is used to treat bladder and kidney stones and inflammation and to prevent the same. A cocktail of chemical constituents has been found to be medicinally active, including flavonoids, saponins and glycosides. One triterpenoid glycoside has been shown to have an antifungal effect against candida. 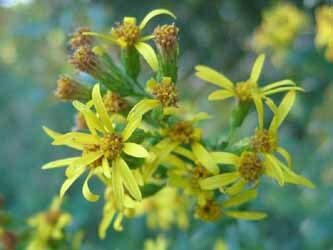 A 700 year history of use in Europe and numerous modern labs studies attest to the safety and efficacy of European goldenrod. An infusion of the flowering tops is used, often in conjunction with echinacea for urinary problems, and for upper respiratory infections, mucus congestion and postnasal drip. Grow in good soil in full sun. Ht. 75cm/30in.